Event in Anchor & Den Restaurant - Grand Cayman - The Beach House Experience - DISCOVER ELEVATED FOOD FROM THE ANDES AT THE A&D PLAYGROUND! DISCOVER ELEVATED FOOD FROM THE ANDES AT THE A&D PLAYGROUND! We had a great time indulging in our love for burgers at this week’s BB Tuesdays where we offered guests our take on some classic American Diner favorites. For our third edition of the A&D Playground on Tuesday, 26th of March, we will be discovering the different elevations of the Andes Mountains and sampling vibrant and colourful dishes from Peru, Ecuador, Bolivia and Chile. 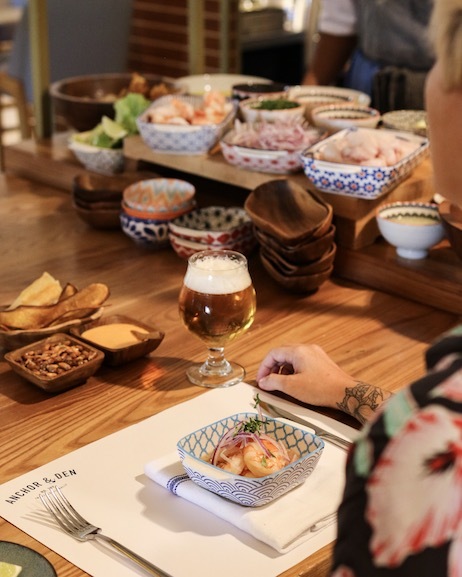 Taste delicious food with ingredients found on Sea Level, such as Ceviche and Tiraditos, the Highlands and the Rain Forest. 1. The Andes, South America’s most magnificent natural attraction, stretches for over 7,500km – from Venezuela all the way to Patagonia – and has spawned, in one way or another, the continent’s incredible natural biodiversity. 2. Down the southern and northern tips of the continent, the Andes literally tumble into the sea, creating a myriad of islands. The Caribbean hubs of Aruba, Curacao and Bonaire are actually peaks of an extensive submerged continuation of the Andes in the north. In the southern end, in Patagonia, there are numerous islands as well which belong to the same mountain chain. 3. The Andes help feed the world! Potatoes and tomatoes, two of the most widespread crops on our planet, originated from the Andes. Over 3,800 different types of potatoes are grown in Peru alone. 4. The largest gold mine in the world is Peru’s Yanacocha, and both Chile and Peru combine to produce almost half of the world’s mined copper. Latest estimates project that yet-to-be discovered copper deposits in the Andes could total a gobsmacking 750 million metric tonnes, along with 13,000 tonnes of gold, 250,000 tonnes of silver and 20 million tonnes of molybdenum, which is a mineral used to harden steel. 5. The Andes is the source of the astounding Amazon River! We can’t wait to see you on the 26th! Make sure to reserve your table soon by emailing hello@anchorandden.com. We are also asking our guests for feedback on which theme is their fave so make sure to tell us if you think our Elevated Food from the Andes night rocks your world!